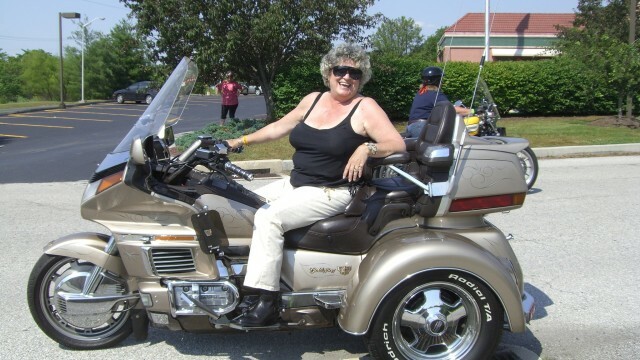 26 years ago, in 1993, The Mid-Atlantic Women’s Motorcycle Rally (MAWMR) was begun by Nancy Warren. 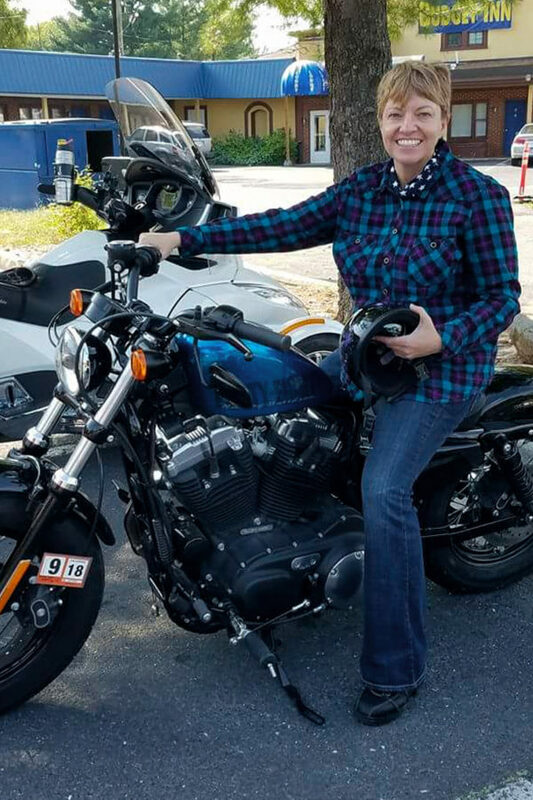 It started as a simple thought; create a community where other women that rode motorcycles could congregate and share their stories. When Nancy started riding, women motorcyclists were a novelty. Now women motorcyclists are one of the fastest growing segments of the market. 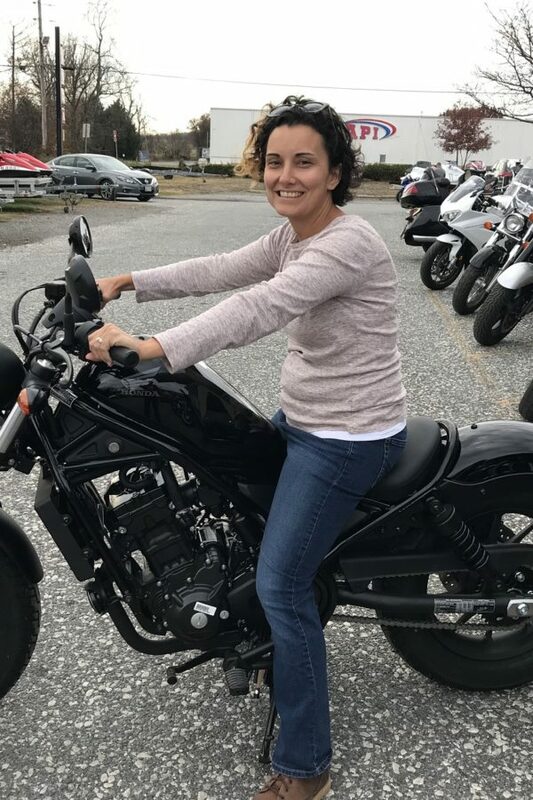 But, there is still a lack of communities focusing on women motorcyclists where women can learn, laugh, ride and just have fun with each other. 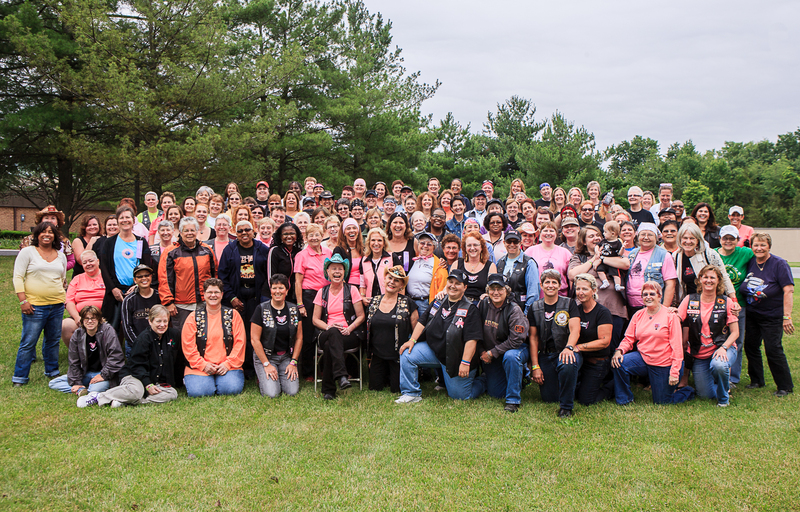 MAWMR is a community of devoted motorcyclists, enthusiasts and friends that wish to continue the tradition of bringing together women to create an environment unlike any other. MAWMR was started with a vision of creating this community, but to also fundraise in support of women who face breast cancer. 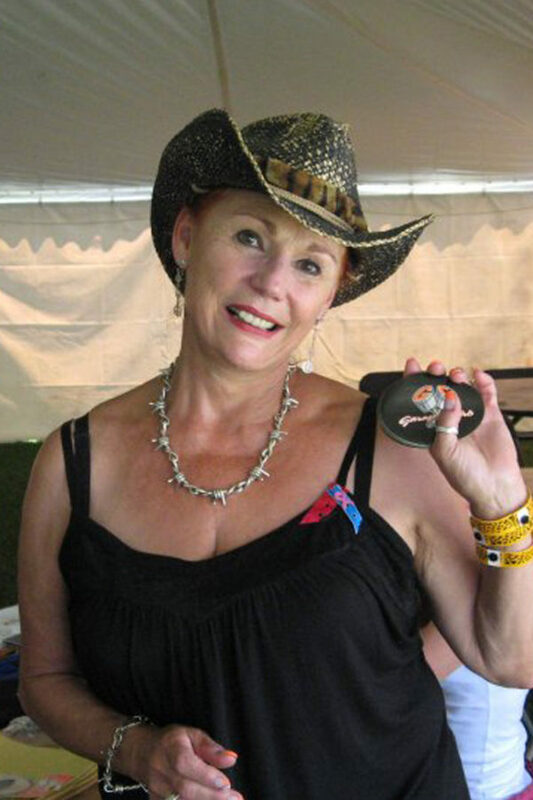 Over the years, the rally has evolved to assist any woman with any challenge surrounding any cancer. 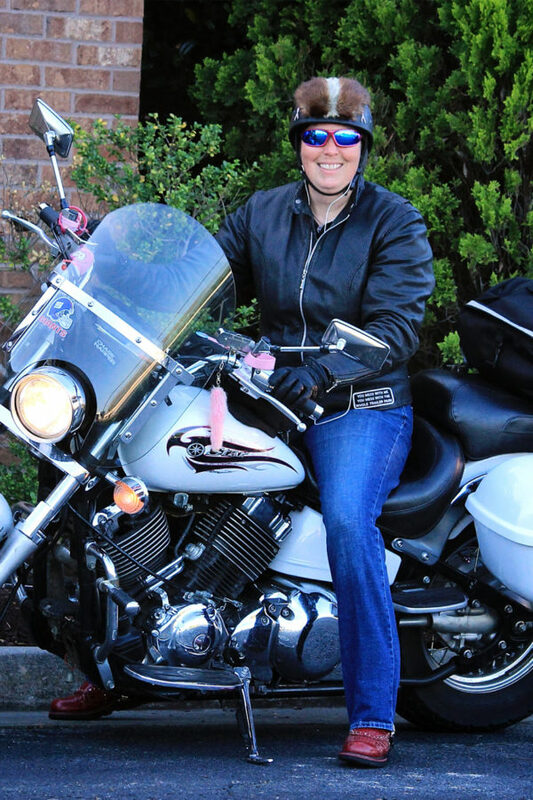 It’s about women motorcyclists helping women with the challenges of cancer. MAWMR is the premiere women’s motorcycling event of the Mid-Atlantic. My friends call me Chicka and my love of motorcycles started with a red Honda Mini Trail. I knew then that motorcycles would always be a part of my life, fueling my independence. Over the years I’ve ridden dirt bikes, mopeds and vintage café racers – until my Mom convinced me to buy a Harley-Davidson. Now I’m on my 3rd Harley and currently ride a StreetGlide. I went to my first MAWMR in 2004 and was amazed by the sisterhood and haven’t missed one since. I became a board member to ensure that others had the same amazing experience that I had and to honor my family members and friends that have fought cancer. My dad always had motorcycles and my sisters and I really enjoyed riding with him. He had a little 125 Suzuki we would ride in the alley. In 2007 my sisters and I got our endorsements and our first bikes. I joined a ladies riding group and had a blast. Riding gives you a feeling of power, freedom, and independence. I went to my first MAWMR in 2016. It's an all-inclusive event. It doesn't matter what you ride. The sisterhood is awesome and it's a lot of fun. I attended my first MAWMR in 2013. I have been riding for 10 years. My first bike was 750 Honda Magna. Now I ride a Harley Davidson 1200 Sportster. I have been riding with two different clubs for about five years. Then I found MAWMR. They are a great group of ladies. This is my first year on the Executive Board. It makes me happy to be on my bike. I ride it to work most of the year until it gets too cold. Sparkle here, known for my smile and welcome greeting. In 2005, I took a leap at a new hobby and signed up for a rider course, purchased a bike, met some great riders, and have been loving motorcycling ever since. I rode a Yamaha VStar in the beginning and now a Kawasaki Vulcan, with renting the occasional Harley Road Glide when traveling. Although I’ve referred MAWMR to riders for many years, I had not attended an event until 2018. It was such an amazing experience, to join in with all the female riders, and to support cancer charities. I have had the pleasure of meeting and riding with some awesome women over the years, and now I look forward to many more meetups and promoting the MAWMR experience as a board member. My road name is Map Girl because I LOVE maps. I have loved motorcycles since I was a kid, my first ride was on the back of my father’s friend’s bike. I ride a Yamaha V-Star Custom and a Yamaha FZ1. I've been riding for 20 years, my first MAWMR was in 1998 when we were in Ocean City, MD and have attended every one since. I love long distance riding, my goal is to ride in every state. To date I’ve ridden in 38 states (including Hawaii)! When I’m not on my bike my other passion is scuba diving, I’m a master diver and love to travel. I have met some of my closest friends at MAWMR, the sisterhood is amazing! My first ride was on the back of my boyfriend’s 350 Kawasaki,6 years later I found myself on the back of a Harley Davidson wearing a “Property of” patch in Southern California. 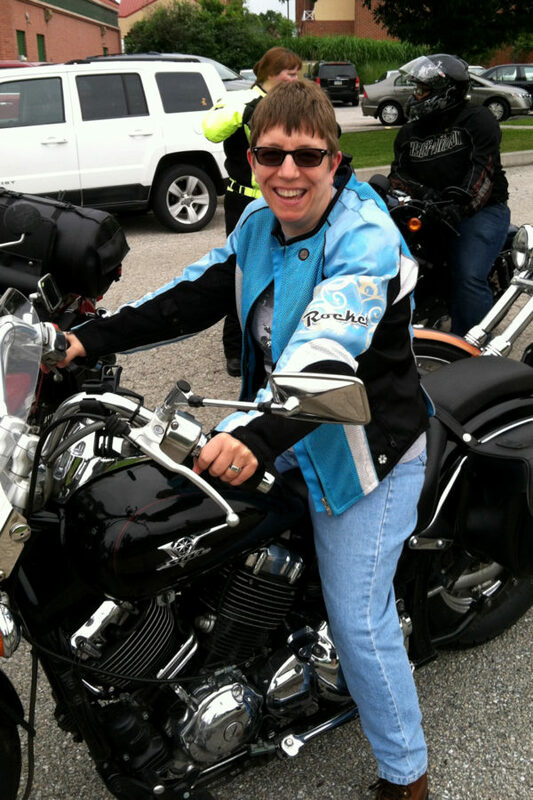 Fast forward to my midthirties and a mom of two sons, I took the PA. Motorcycle Safety Course. 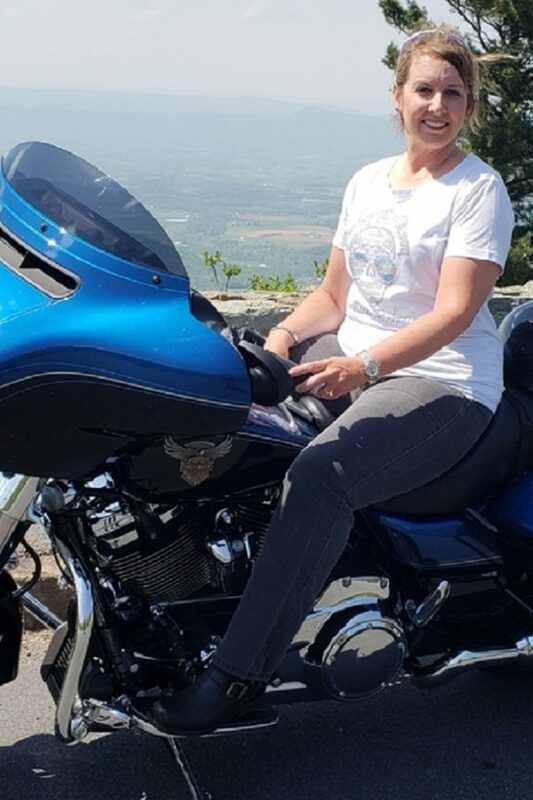 I rode for 3 months on a 250 Honda Rebel then moved up to my husband’s 1100 Sportser, my first new bike 11 years later was a 2002 Heritage Softail Classic and now my favorite ride of all time, “HOPE” my 2007 Road King Custom. With grandchildren and gray hair now, 28 years of riding has taken me many miles in many states, even into Canada. But in 2007 after a very heartbreaking year I attended my first MAWMR event. It felt like home! I met the most amazing women that weekend in Gettysburg and I have formed many bonds of sisterhood since, I have not missed a year yet. I thank God for this event and I look forward to meeting more amazing women to ride with each and every year. Blessings! My name is Anna. I've never driven a motorcycle. I always wanted to. Life and finances always got in the way. I've ridden on the back of a few. My Aunts and my cousin, who all ride, talked me into attending MAWMR. My first one was in 2007. From the first day, I met phenomenal women and made life-long connections. The fundraising, and the the families we support, really grabbed a hold of me. I haven't missed one since. These people are my soul family!!! Due to a couple of injuries, I was fearful of even taking the motorcycle course. 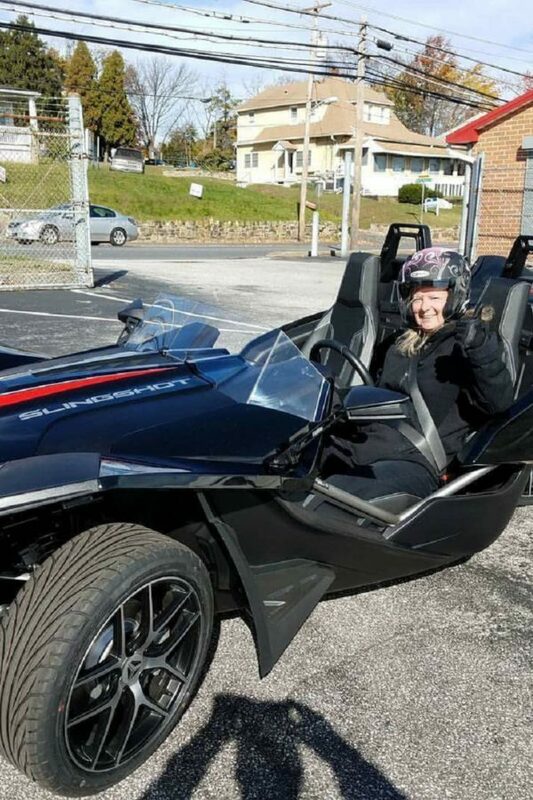 Then the Polaris Slingshot came out! Boom!!! I was sold! The day I drove it home, it was 20 degrees out! I was proud as a peacock to drive it to MAWMR last year!!! I want every one who comes to MAWMR to be able to make the same kind of connections. I want everyone to value and recognize the love and support we give to those fighting cancer and to each other, as well. When the opportunity to join the board came up, I immediately threw my hat in the ring. I'm excited to be a more influential part of this group that has touched me so deeply! My riding name is Carmel. I began my two-wheel journey riding minibikes and dirt bikes at about 8 years old. As a teen and into adulthood I would ride whatever anyone would allow me to ride. I put my riding on pause to raise my family and I finally purchased my first street bike, a Kawasaki ZX-10 the day before I took the Motorcycle Rider Course in 2003. In 2005, I purchased a brand new Hayabusa, and in 2013 for my birthday I bought a custom trike kit that my husband built for me. My love of motorcycles led me to attend my very first MAWMR event in 2005. As the only sport bike there, I stood out but it definitely was a conversation starter. I was swept in by the group's welcoming spirit and its amazing purpose. 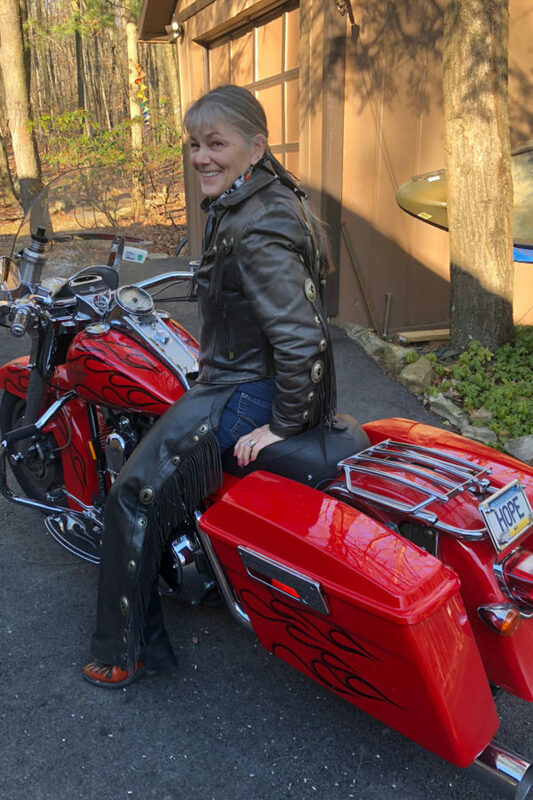 Bringing women riders together to raise funds for cancer, to share the love of the sport of motorcycling, and to be part of a wonderful sisterhood. I decided to become board member to be able to further this cause and to extend the sisterhood by utilizing my network of contacts and my creative spirit to keep MAWMR growing and fresh. I started riding on the back of my husband's bike when we were dating. After we married he bought me a 250 Honda. Once I learned to ride, I was hooked. That was 27 years ago. There weren't a lot of women riders back then so when I was invited to the first MAWMR it was so great to see so many other ladies on bikes. I've been to every MAWMR since then. After having so much fun for 25 years, this year I decided it was time to give back by being on the board. Each year is like a family reunion when I see ladies from all over the East Coast come together again to support a cause that is important to us all. Growing up in WV, I've always enjoyed the outdoors. My dad introduced me to motorcycle riding and I completed a safety course to obtain my endorsement. Years later, in 2015, I began riding a '08 Sportster, riding 10,000+ miles that first year. 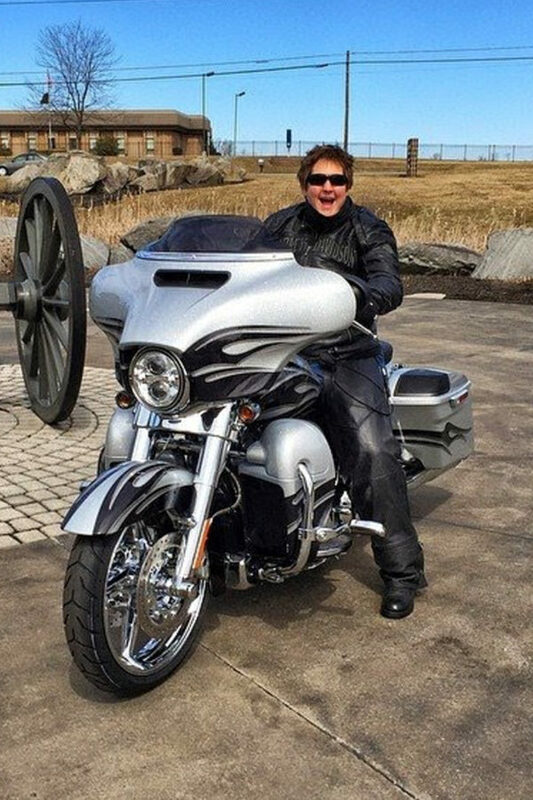 In 2016, I rode a '10 HD Deluxe, and currently, a '18 HD StreetGlide, with my tagline ``bluIZ``. I've enjoyed 18,003 miles this past riding season, aside from a few longer distance trips, have mostly been in the beautiful Shenandoah Valley (heart of the rally location) and surrounding 4 state area. 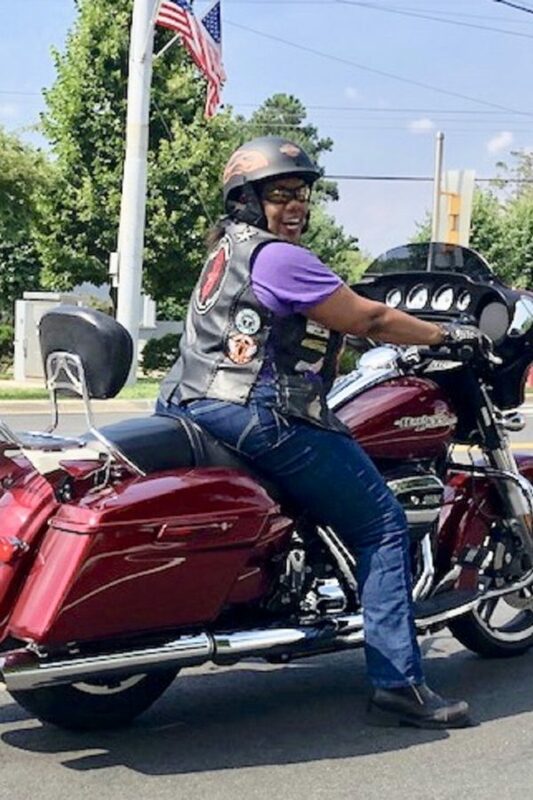 I enjoy solo riding, group riding with women's or ministry based clubs that I'm a member, and riding with my husband and entire family! I'm absolutely thrilled to be a MAWMR board member! 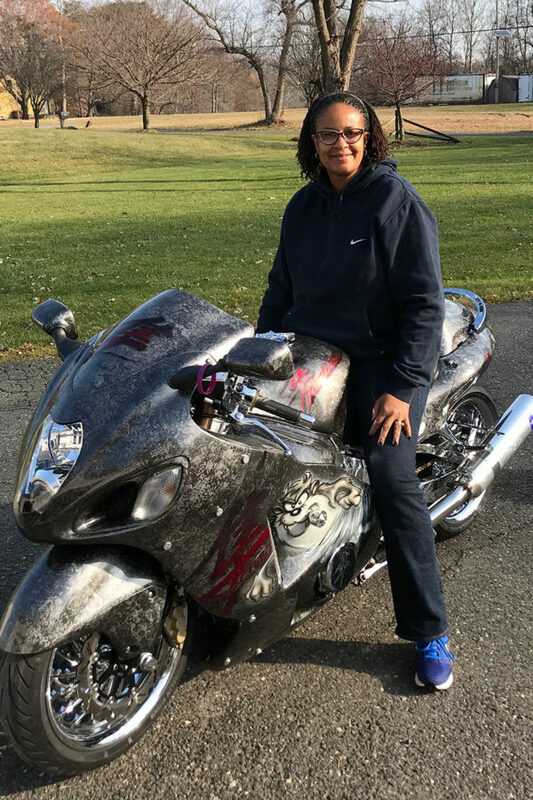 I welcome the opportunity to utilize my passion of motorcycling to help facilitate the friendly comradery, outreach to women motorcycle enthusiasts, all while supporting meaningful causes. Looking forward to an outstanding rally! I have been riding for a year now and have loved every moment of it. 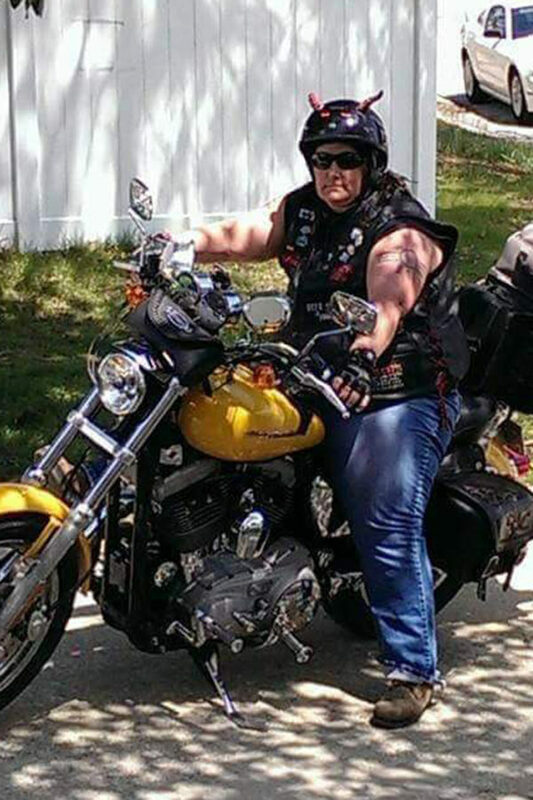 My kids say I got my inspiration to ride from watching Sons of Anarchy but I have always wanted to ride. I currently ride a Honda Rebel 300 but don’t let the cc’s deter you because I ride with and for the most part keep up with the best of them. My first MAWMR was last year and it was a great experience. I have meet some of the best women I have ever known through MAWMR and I now call them family.